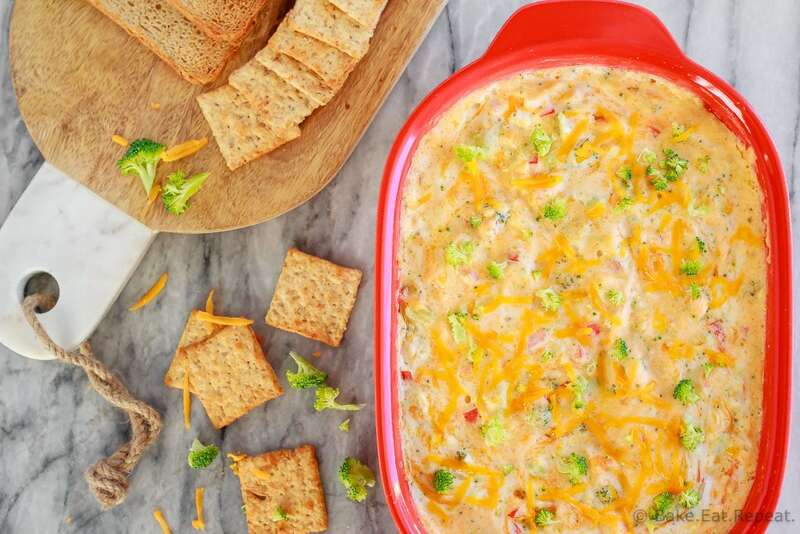 This hot, baked broccoli cheese dip is easy to mix up and can be made ahead of time. 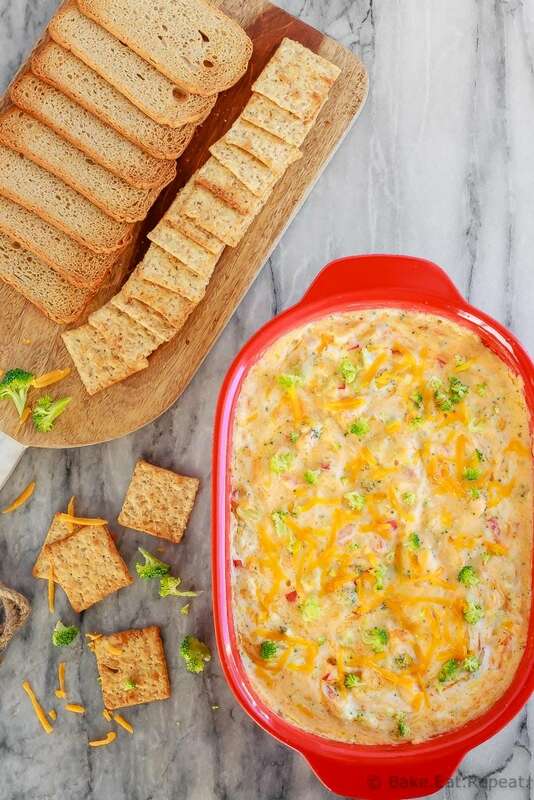 Everyone will love this appetizer served with crackers, chips or veggies! We love appetizers here, especially around the holidays. There’s always so many parties and family gatherings – and food is always a big part of those events. 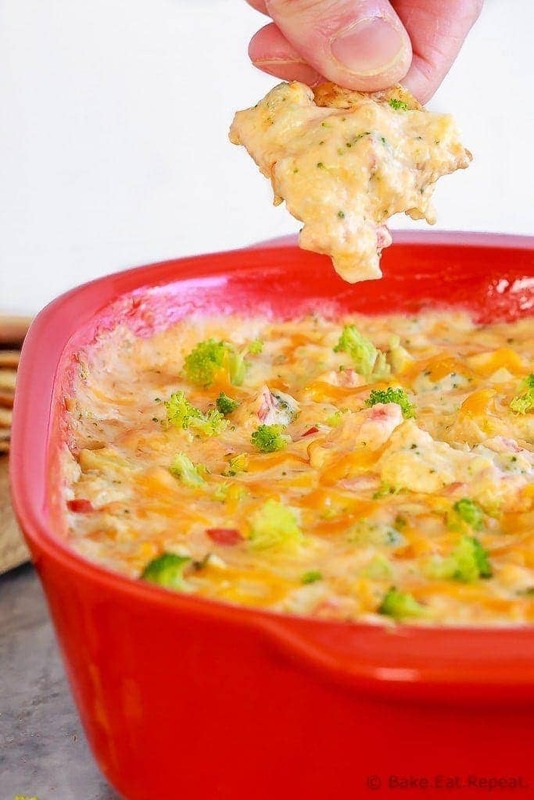 I find that you always need appetizers around the holidays – and this baked broccoli cheese dip was a hit when I brought it to a family get together last weekend. So it’s definitely going in the make it again recipe pile! It was so easy to make – all you need to do is stir together all the ingredients and then spoon it into a baking dish – and that can all be done up to a couple of days before you actually need to serve the dip. I love make ahead options for food that I’m bringing somewhere else, it’s so much easier when you can make it when you have time rather then immediately before heading somewhere! 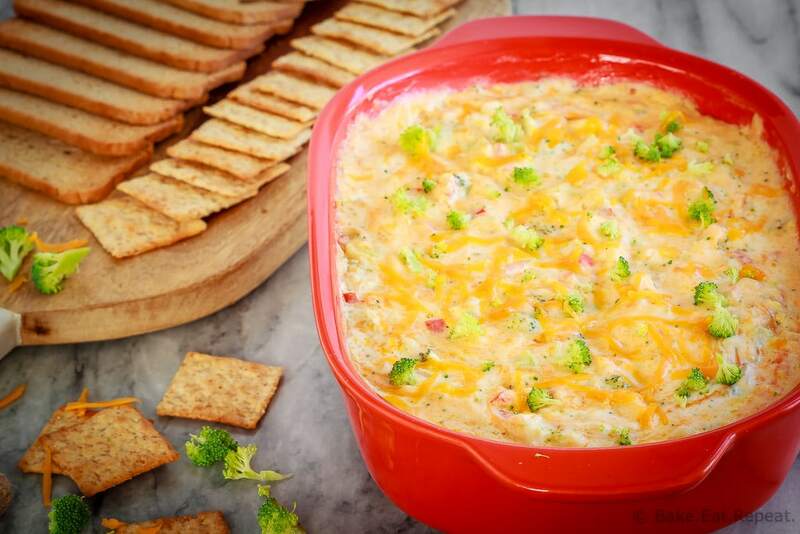 This baked broccoli cheese dip was adapted from a recipe I found in my mom’s old recipe card box. I have no idea where she got it, it was just hand written on a scrap piece of paper – but it looked good so I tried it out. I’m so glad I did because we really enjoyed this dip! Hot and cheesy appetizers are the best kind – I hope I need to bring food to some other event again soon – because I probably don’t need to make this again just for my family! Although….there are a lot of veggies in this dip….so it’s basically a health food right? Yeah…I should make it again. I’ve also shared this Baked Broccoli Cheese Dip recipe over on The Weary Chef. In a medium bowl, use an electric mixer to combine the cream cheese and the sour cream until smooth. Stir in the garlic, cheddar cheese, parmesan cheese, broccoli, red pepper, and onion until combined. Spoon the dip into a 1.5 quart (1.4L) baking dish and bake for 25-30 minutes, or until hot and bubbling. Serve with chips, crackers or veggies. Refrigerate leftovers, and reheat it at 350F for 20-30 minutes, covered with aluminum foil.